Posted 9 April 2014 & filed under Progress. The website isn’t fully up yet, but I don’t think that should keep me from blogging. Since the purpose of this blog is more or less to track my progress in life and art, I’ll give a little summary of what I’m working on. I hope to do this weekly. A friend (hi Doris!) gave me a sweet gift when I saw her in Ghent a couple weeks ago. 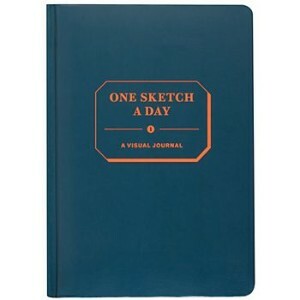 It’s called One Sketch A Day – A Visual Journal. I began using it on 1 April, and it’s been really nice. It’s a different kind of sketching than I’m used to (change is good! ), since it has space for two sketches per page and there are size limitations and the paper is thin. So it is truly just for sketching and there’s no possibility of me using any of these as drawings for prints. Which is really freeing! I can try out different ideas without feeling pressure to produce anything amazing. One of the sketches I produced is possibly the worst thing I’ve ever drawn, but a few of the others work really well and will be redrawn. So far so good. I’ve also been preparing for my next project, which will be embroidering a sketch I drew ages ago. I let Jonas pick it because I couldn’t decide, and since he has no idea about embroidery, he picked something rather challenging. Let’s just say that there will be lots of French knots. Blerg. Once I have progress photos to share, I will. I will be opening a web shop in cooperation with my mother (who is my master printmaker). I have selected the initial drawings, and soon she’ll start printing. I’m guessing we’ll be open for business some time in the summer. I’ve also finished two ceramic pieces, but I’m waiting for them to go to the kiln. I think I’ll pick them up in about two weeks. Once the results are in, I’ll do a full post about the pieces and the process. On Saturday, I bought a beef tongue. It was over 1kg, so I’m still eating it. So far I’ve had it on a sandwich, sliced with beets and sauerkraut, and last night with rice and homemade salsa. There’s still enough left to feed two people. It’s been quite a project. Buy a larger embroidery hoop. Figure out what the hell to do with the rest of this tongue. Use the stock made when boiling the tongue.